Arsenal star midfielder Mesut Ozil made a young fans dream come true by giving his playing shirt to him after the club's 3-0 victory over Chelsea on Saturday. 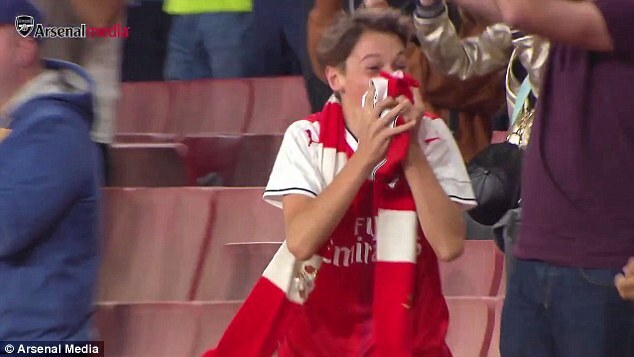 The young fan wasn't to know his day could get any better at the final whistle after goals from Alexis Sanchez, Theo Walcott and Ozil fired Arsenal to victory. The fan was clearly elated when Ozil threw his shirt to him in the crowd and looked somewhat shocked that a player of his calibre chose to give him the shirt out of all the remaining Arsenal fans in the stands. shone for Arsenal against London rivals Chelsea and put the icing on the cake by volleying home Sanchez's cross to make it 3-0. The German international was excellent throughout on Saturday and Chelsea had no answer how to deal with him, especially in the first half. Ozil and his Arsenal team-mates brilliance on Saturday ensured Arsene Wenger celebrated his 20th anniversary with a win against a team he hasn't beaten in the league since October 2011.